Ramachandran Karthik, Venkatesan Manigandan, Ramachandran Saravanan, Rajaian Pushpabai Rajesh and Baby Chandrika "Structural characterization and in vitro biomedical activities ofsulfated chitosan from Sepia pharaonis" International Journal of Biological Macromolecules, 84, 319–328, (2016). P. Nagapandiselvi, C. Baby, R. Gopalakrishnan Synthesis, growth, structure, mechanical and optical properties of a new semi-organic 2-methyl imidazolium dihydrogen phosphate single crystal ,Materials Research Bulletin, 81, 33–42, (2016). S. Prusty, S. Krishnaswamy, S. Bandi, B. Chandrika, J. Luo, J. S. McIndoe, G. S. Hanan and D. K. Chand. "Reversible Mechanical Interlocking of D–shaped Molecular Karabiners bearing Coordination-Bond Loaded Gates: Route to Self-Assembled  Catenanes". Chem. Eur. J., 21,15174–15187 (2015). P. Nagapandiselvi, C. Baby and R. Gopalakrishnan. "Synthesis, growth, structure and nonlinear optical properties of a semiorganic 2-carboxy pyridinium dihydrogen phosphate single crystal", Optical Materials, 47, 398–405 ( 2015). P. Nagapandiselvi, C. Baby and R. Gopalakrishnan. "Self assembled supra molecular structure of 1–Methyl piperezenium 4-nitrophenolate 4–nitrophenol mono hydrate single crystal: Synthesis, growth, thermal and photophysical properties". Spectrochimica Acta Part A: Molecular and Biomolecular Spectroscopy, 147, 270–279 (2015). C. Deoghare, C. Baby, V.S. Nadkarni, R. N. Behera and R. Chauhan. "Synthesis, Characterization and Computational Study of Potential Itaconimide-based Initiators for Atom Transfer Radical Polymerization". RSC Adv., 4, 48163–178. (2014). P. Nagapandiselvi, C. Baby and R. Gopalakrishnan, "supramolecular structure of N,N,N',N'-tetramethylethylenediammonium-bis-(4-nitrophenolate):synthesis, single crystal growth and photo physical properties". RSC Adv., 4, 22350–22358 (2014). H. Iqbal, V. Prabhakar, A. Sangith, C. Baby and R. Balasubramanian. "Synthesis, anti-inflammatory and antioxidant activity of ring-A-monosubstituted chalcone derivatives". Med Chem Res. 23, 4383–4394 (2014). P. Nagapandiselvi, C. Baby and R. Gopalakrishnan. "A new Schiff base, (E)–4–(4–chlorophenylimino) methyl)–2–methoxyphenol: Crystal structure, Thermal behaviour, Solid State Fluorescence, DFT calculations and FT NMR spectral Analysis", J. Mol. Str., 1056–1057, 110–120 (2014). R. Baskar, C. Baby and K. Subramanian. "Synthesis, characterization and dynamic NMR studies of a novel chalcone based N substituted morpholine derivative" J. Mol. Str.,1040, 90-97 (2013). R. Balasubramanian, H. Iqbal, R. V. Gopal and C. Baby. "Synthesis and preliminary evaluation of a focused chalcone library for anti-inflammatory activity", IJPER, 47, 31–37 (2013). Baby Chandrika, Laura K. Schackenberg, Poovathinthodiyil Raveendran and Scott L. Wallen. "High resolution 1H NMR structural studies of Sucrose octaacetate in supercritical carbondioxide". Chem. Euro. J, 11, 6266–627(2005). Matsumoto K, Thirumaran A, Chandrika B, Devasahayam N, Cook J, Mitchell J, Subramanian S, Krishna M. "In vivo electron paramagnetic resonance oxymetry: Comparison of continuous wave and pulsed techniques", Free Rad. Biol. Med., 35: S147– S148 462 Suppl. 1 (2003). Ken–ichiro Matsumoto, Baby Chandrika, Joost A.B. Lohman, James B. Mitchell, Murali C. Krishna, and Sankaran Subramanian. "Application of continuous wave EPR spectral-Spatial Image Reconstruction Techniques for in vivo Oxymetry: Comparison of Projection Reconstruction and Constant-Time Modalities" Magn. Reson. Med., 50, 865-874 (2003). C. Baby, T. Ratinavelan, S. Naicker and S. Subramanian. "Solution structure of a disialyl biantennary undecasaccharide: New insights into the conformational behavior across the two arms of the diantennae". Presented at the 21th NMRS Symposium held on March 06-09, 2015 at GNDU, Amritsar, INDIA. Deoghare C., Baby C., Nadkarni V. S., Ghosh N. N., Behera R. N. and Chauhan R. "Controlled Radical Copolymerization of N-aryl itaconimides with Methyl Methacrylate via Atom Transfer Radical Polymerization", Presented at Macro-2015, International Symposium on Polymer Science & Technology, January 23-26, 2015, IACS, Kolkata, INDIA. Deoghare C., Baby C., Behera R. N. and Chauhan R. "Effect of Structure, Solvent and Temperature on Equilibrium Constant of Atom Transfer Radical Polymerization for Bromosubstituted Succinimides". Presented at the 7th CRSI National Symposium in Chemistry, February 06-08, 2015, CSIR-NCL, Pune, INDIA. C. Baby, S. L. Wallen, S. S. Naicker and S. Subramanian. "Solution structure of a novel di-sialyl oligosaccharide isolated from egg-yolk". Presented at the 44th ENC, held on March 30-April4, 2003 at Savannah-Georgia, U.S.A.
C. Baby and S.L. Wallen. "Solvent interactions determine solution conformation of Sucrose octaacetate". Presented at the 223rd ACS National Meeting, held on April 7-11, 2002 at Orlando, Florida, U.S.A.
Matsumoto, K., C. Baby, J.A. Lohman, J. Mitchell, S. Subramanian and C.M. Krishna. "In vivo electron paramagnetic resonance oxymetry: Comparison of continuous wave and pulsed techniques", Presented at the 10th International workshop on Bio-Medical ESR Spectroscopy and Imaging, held on April 1-3, 2003 at Fukuoka, JAPAN. Wallen, S.L., P. Raveendran, M.A. Blatchford, L.K. Schoenbachler, B. Chandrika, and E.D. Dawson. "Novel CO2-philes: Weak hydrogen bonds, solvation, and applications". Presented at the 223rd ACS National Meeting, held on April 7-11, 2002 at Orlando, Florida, U.S.A.
Wallen, S. L., P. Raveendran, J. Fu, and B. Chandrika "Renewable, Biologically based CO2-philic systems: Traditional Analysis to Nanomaterial production in an Environmentally Benign Solvent system". Presented at PITTCON held on March 17-21, 2002 at New Orleans, LA, U.S.A.
C. Baby, M. S. Moni, and S. Subramanian. "Towards understanding the conformation and Dynamics of Biologically important Oligosaccharide Systems". Presented at XXI ICMRBS, held on January 16-21, 2005 at Hyderabad, INDIA. Blatchford, M. A., L. K. Schoenbachler, C. Baby, P. Raveendran, and S.L.Wallen "Examination of CO2-soluble carbohydrates and related simple molecular systems using High pressure NMR spectroscopy". Presented at the 44th ENC, held on March 30-April 4, 2003 at Savannah-Georgia, U.S.A.
C. Baby, S.L. Wallen, S. Selvaraj and S. Subramanian. "High resolution NMR spectroscopy in the conformational analysis of biologically important oligosaccharide systems". Presented at the symposium on NMR drug design and bioinformatics, held on February 17-20, 2004, at Bose Institute, Kolkata, INDIA. C. Baby, S. Selvaraj and S. Subramanian. "Two dimensional NMR investigations of a novel Synthetic Tumor Associated Glycoconjugate (S-TAG)". Presented at the 7th NMRS Symposium, held on February 7-10, 2001at CLRI, Madras, INDIA. C. Baby and S. Subramanian. "Spectral separation of a Synthetic Tumor associated Glycoconjugate (S-TAG) by 1D TOCSY". Presented at the 5th NMRS Symposium held on February 23-26, 1999 at IIP, Dehradun, INDIA. National Workshop on "Optical Spectroscopy", 02-03 July, 2018. National Workshop on "Nuclear Magnetic Resonance (NMR) Spectroscopy", 05-07 March, 2018. National Workshop on "Nuclear Magnetic Resonance (NMR) Spectroscopy", 25-27 February, 2015. Workshop on "Theory and Applications of ESR Spectroscopy", 10-11 December, 2013. Workshop on "Application of FT NMR Spectroscopy", 21-22 March, 2013. Short-term course on"Nuclear Magnetic Resonance (NMR) Spectroscopy", 8-10 March, 2012. Workshop on "Application of 1D & 2D NMR Spectroscopy" 28-29 October, 2010. Short-term course on "Nuclear Magnetic Resonance Spectroscopy" 28 -29 May, 2009. Workshop on "Application of 1D & 2D NMR Spectroscopy" 4-5 September, 2008. "Nuclear Magnetic Resonance Spectroscopy", National Workshop on Spectroscopic Techniques WcST-2019, Sathyabama Institute of Science & Technology, Chennai, 30th January 2019. "High Resolution NMR Spectroscopy and its Applications", Short term course on Analytical Techniques, Annamalai University, Chidambaram, 3-9 Dec, 2018. "Thermal Analysis Techniques", Workshop on Materials Characterization Techniques, SRM Institute of Science& Technology Vadapalani Campus, Chennai December 10-11, 2018. "Triple Resonance (3D) NMR Spectroscopy and Protein Structure Determination, Department of Biotechnology, IIT Madras, 07-11-2018. "Two Dimensional NMR Spectroscopy and its Applications", Department of Biotechnology, IIT Madras, 31-10-2018. "NMR Relaxation", Department of Biotechnology, IIT Madras, 24-10-2018. "High Resolution NMR Spectroscopy", Department of Biotechnology, IIT Madras, 17-10-2018. "High Resolution NMR Spectroscopy: Spectral Interpretation and Applications", National Workshop on Nuclear Magnatic Resonance(NMR) Spectroscopy, SAIF, IIT Madras, 05-07 March, 2018. "Homonuclear two dimensional NMR spectroscopy and its applications", workshop on NMR and MS-Theory, Instrumentation and Application in Chemical/Biological Research, Sririvasa Ramanujam Insttitute of Basic Sciences (SRIBS), Kottayam,Kerala 27-29 October, 2017. "Heteronuclear two dimensional NMR spectroscopy and its applications",, workshop on NMR and MS-Theory, Instrumentation and Application in Chemical/Biological Research, Sririvasa Ramanujam Insttitute of Basic Sciences (SRIBS), Kottayam,Kerala 27-29 October,2017. "High Resolution NMR Spectroscopy and its Applications", Workshop on Recent Trends in Analytical Techniques, Anna University, Chennai, 27th September, 2017. "A Bird's Eye view on Modern NMR Spectroscopy and its Applications", National Seminar on NMR Spectroscopy & its Biomedical Applications, Mar Ivanios College, Thiruvananthapuram, 6-7 October 2016. "Introduction to Protein Structure determination by NMR" Department of Biotechnology, IIT Madras, 10th November 2014. "Three Dimensional NMR Spectroscopy" Department of Biotechnology, IIT Madras, 14th November, 2014. "Solution NMR: Advanced Methods and Applications" Workshop on NMR and MS organized by Srinivasa Ramanujan Institute For Basic Sciences, Cochin University of Science & Technology, Kerala, 18-20 July 2013. "Applications of 2D NMR spectroscopy" Workshop on Application of FT NMR Spectroscopy, SAIF, IIT Madras, 21-22 March, 2013. "An Overview of FT NMR Spectroscopy" Workshop on Application of FT NMR Spectroscopy, SAIF, IIT Madras, 21-22 March, 2013. "2D NMR: Spectral Assignment & Applications" Short-term Course on Nuclear Magnetic Resonance (NMR) Spectroscopy, SAIF, IIT M, 08-10 March, 2012. "Advanced NMR Methods-II" Workshop on NMR Techniques, Sophisticated Test & Instrumentation Centre, Cochin University of Science & Technology, Kochi Kerala, 15th January 2011. "Modern NMR Spectroscopy", Workshop on Application of 1D & 2D NMR Spectroscopy, SAIF, IIT Madras, 28th October, 2010. "2D NMR Spectroscopy", Workshop on Application of 1D & 2D NMR Spectroscopy, SAIF, IIT M,29th October 2010. "Modern NMR Spectroscopy", Short-term Course on Nuclear Magnetic Resonance Spectroscopy, SAIF, IIT M, 28-29 May 2009. "High Resolution NMR spectroscopy: An Overview", Workshop on Application of 1D & 2D NMR Spectroscopy, SAIF, IIT Madras, 4-5 September, 2008. "Thermal Analysis Techniques" Training program for Engineers on Analytical Instruments, C-Tech Environmental Laboratory, Chennai, 05-16 March 2012. "Hyphenated Techniques" Workshop on Thermal Analysis for the Next Millennium, IIT Madras, 21-23 October 1999. "Thermal Methods of Analysis". Short term Training program on Scientific Instrumentation, RSIC, IIT Madras, 6-10 December, 1999. "Thermal Analysis Techniques". Certificate course on Advances in Instrumental Analysis., Dept. of Chemical Engineering, Anna University, Chennai- July 3-8. 2000.
International Workshop on "Protein Structure Determination", NMRFAM, Madison, USA (2007). National Workshop on "Application of Modern High Resolution NMR Spectroscopy", Tata Institute of Fundamental Sciences (TIFR), Mumbai , INDIA (2000). National Workshop on "Applications of NMR in Petroleum and Petrochemical Industries" Indian Institute of Petroleum (IIP), Dehradun, INDIA (February, 1999). Obtained in-house training on "Advanced NMR Methods" at M/s. 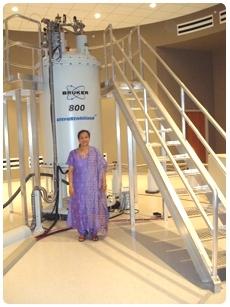 Bruker Biospin, SWITZERLAND (2010). Obtained in-house training on "NMR of Labeled Proteins" at M/s. Bruker Biospin, SWITZERLAND (2010). Obtained in-house training on "Thermal Analysis Systems" at M/s. NETZSCH GmbH & Co, Selb, GERMANY (2000). Obtained in-house training on "JES FA200 Model ESR Spectrometer" at M/s. JEOL Ltd., Tokyo, JAPAN (2014). Obtained in-house training on "Advanced NMR System Operation" at M/s. Bruker Biospin, SWITZERLAND (2018).